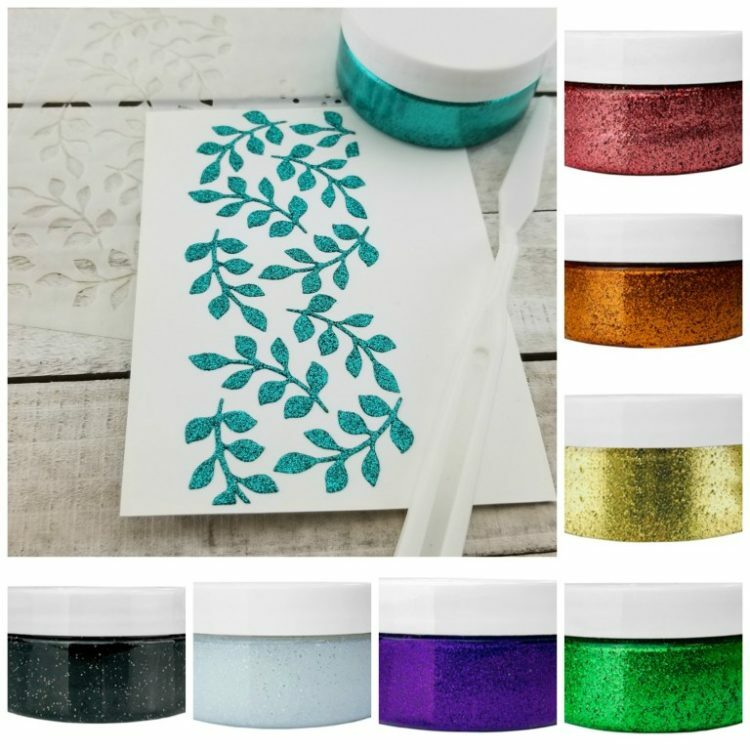 Stamp-n-Stencil and Glitz Blog Hop! Good morning and welcome to our blog hop! 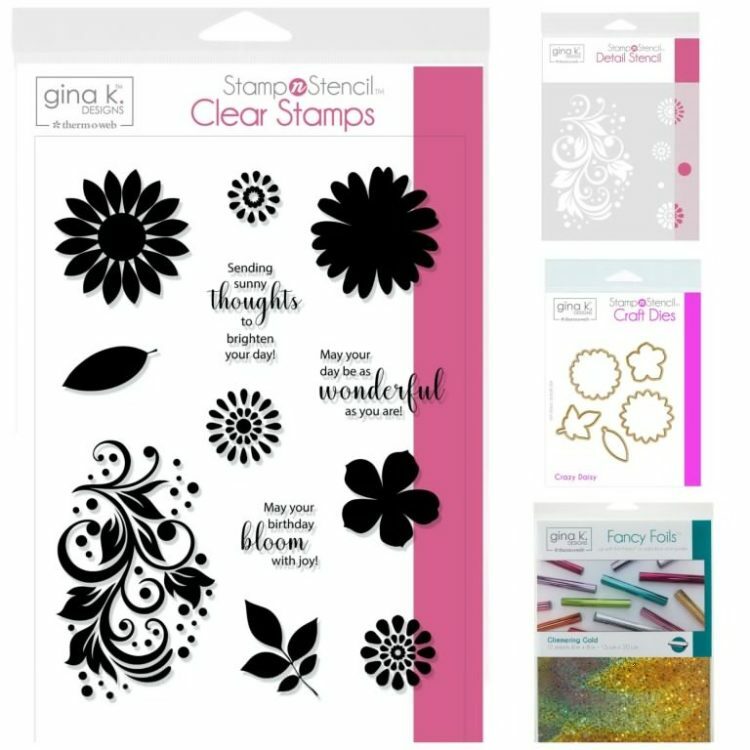 Today, we are featuring the brand new Stamp-n-Stencil system along with Glitz Glitter Gel. If you haven’t tried the Glitz Glitter Gel yet, you’re going to love it! This gel is nothing but pure glitter encased in a clear gel which makes it super creamy smooth to apply. And with no pigments, paints or dyes, you get nothing but pure enhanced shine. Last week, I share a video showing you how to use the Stamp-n-Stencil and I will have another video for you later this week showing you how to line up images. But today, I am featuring two projects and videos from some people we all adore! First, Rina K. shows you how to use the gel to create a marble look. This looks like the inside of a gorgeous geode! Rina’s video is so funny! Make sure you click through and subscribe to her channels for your weekly laugh. She’s real, raw and shows you all the funny stuff that happens in her craft room along the way. Find her YouTube channel HERE. Then, the amazing Cathy Z. created this gorgeous card! She used Gina K. Designs ink along with one of the new stencils to create the swirl element with the white gel. This is so breathtaking. I can’t stop looking at it! You can read more over on Cathy’s Blog HERE. She is a wealth of knowledge, ideas and just makes such pretty things. She’s such a kind person and I adore her! I highly recommend following her. 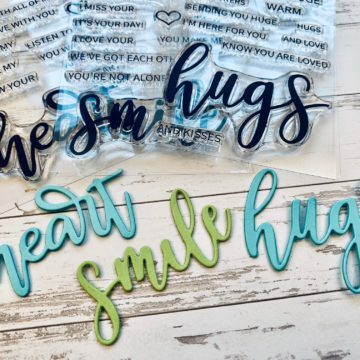 Now the design team is ready to inspire you with beautiful projects with everything from Stamp-n-Stencil to using the Gel with other stamps and dies in your craft room! What a beautiful addition to any card project! I absolutely love that card! Love your products Gina! I love the colors and amazing amount of sparkle! Love both Rina and Cathy’s videos! They’ve got me very excited to play with the glitter gel! This was my favorite product from Creativation. I can hardly wait to get my hands on it. This Glitz Glitter Gel is wonderful. Can’t wait to try it. So excited try these glitters! Wow! They are beautiful cards! Everything you design is of such high quality. I cannot wait to try this! OMG this new product looks perfect for my glitter ‘fix’ – so creamy and sparkly!! I bought all the colors of the Glit Glitter gel and can hardly wait to add it to everything! Love all these new ideas! Do I like glitter? I bleed glitter! Two great ideas and great videos! I can’t wait to try the Glitz glitter gel! Can’t wait until I can order the glitter gel. Looks like a great product. Can’t wait to try it! Love the glitter gel!! I’m ready to begin using it and do appreciate all the ones on the blog hop to give me ideas! Beautiful!! Yay! I’m so excited to ba a part of this blog hop. I just love the work your whole team does. And, I’m very excited to get the glitter gel. Thanks for allowing me to join the community and play along. Beautiful projects. I can’t wait to try out the Glitz Glitter Gels! How fun! Can’t wait to see all of the projects with the new products! wonderful–off to hop and see the other creations. This looks like so much fun to play with! Due to this blog hop I was forced, against my very will, to purchase some glitter gels and stencils today. The spirit will strong but, as usual, the flesh was weak. Your ideas help jump start my creativity!! All of these cards are absolutely brilliant!! Watched both the videos…both these girls crack me up! Anyway, I commented to Rina that I’ve never actually used glitter gel, but am giving some store bought gel a try sometime this weekend. Looks like you have some beautiful colors to work with!! I just wanted to tell you that I wasn’t able to leave a comment on Lisa’s blog. I think that she know there is a problem because she left a TEST COMMENT. The colors are lovely and the gel is just enough.. Excited.. Thanks for the beautifully creative inspiration! So much creativity in this hop, beautiful cards from everyone. Gina, you are killing my pocket book. ha ha. Not really. I Love all the new gels and stamps. The are so pretty. Thanks for all you do. I love the easy application. And the colors speak to me!!! Seeing so many beautiful creations with this. Can’t wait to play with it! Wowza! Amazing cards and can’t wait to try your glitter gel. Rina and Cathy’s cards are beautiful. The new products are awesome ! Amazing creations with these products. I don’t have and glitter gel but will be adding that to my list of must haves, so pretty. Everyone is so creative. So many ideas for glitter gel. I love, love, love glitter. I always use glitter in finishing up my cards. Thanks for your video. OMGosh – that geode looks is ah-MA-ZING! 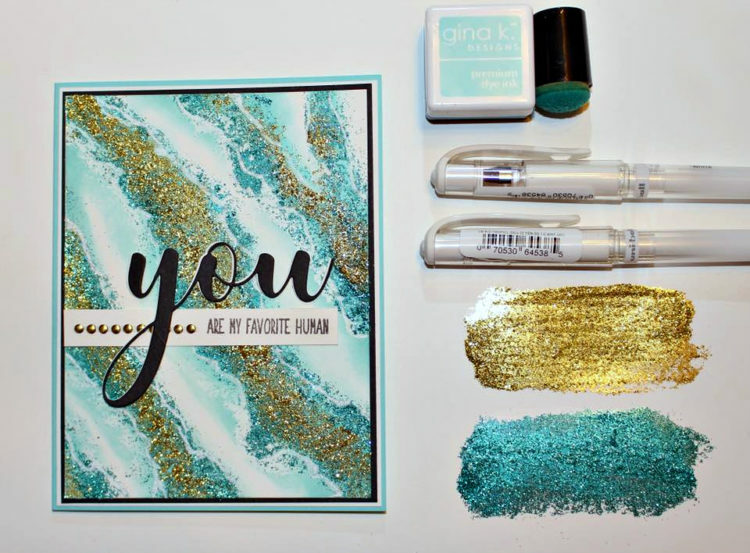 I’d be willing to be glittery for 3 weeks to make that card 😉 The overlay of the swirl stencil in white is so classy – these glitter gels are a must have! I enjoyed the blog hop. I might give these new gels and stencils a try sometime. It’s so beautiful, I cannot wait to play with all the colors!!! There is nothing better than glitter! There is nothing better than glitter! Just ask my twin granddaughters! I am crazy about Glitter Gel! I want them all!!! The Glitz Glitter Get is amazing. I love the look of it with the stencil on this card. I can’t wait to try it. I’m very new to card making and there is just so much to love. I love the glitter gel and the stencils and the ideas. So many ideas. The effect of the glitter is gorgeous. Can’t wait to try it. 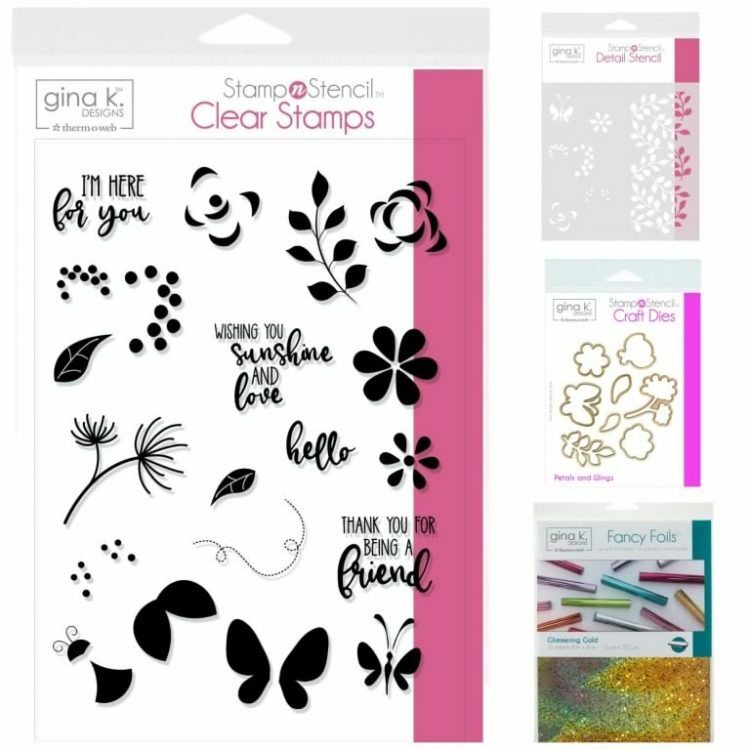 Love love love these new products I’ve been watching and reading everything I can on how to use these new stamps stencils and glitz gels. The colors are so vibrant. I can’t wait to get my hands on some. Thanks for all of the inspiration you have given us to craft. 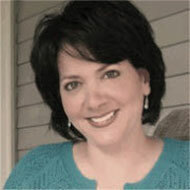 Finished the Hop, but couldn’t find a place to leave the comment on Karen Hightower’s blog. 🙁 *And* already placed an order, but may have to go order some more!!! Love the project. That spray is amazing too. I got mine this week…and LOVE THEM!! OK — this Glitz Glitter Gel is gorgeous! I love the vibrant colors and your samples are wonderful. Can’t wait to start hopping. Love the colors and sparkles. This looks like fun stuff to work with. How gorgeous! Who doesn’t need more glitter and glitz? I can’t wait to play with this new medium! Thanks for the great inspiration! OMG! I love this stuff!! Already watched Rina’s video and will check out Cathy’s before I start hopping. After seeing these two gorgeous cards, I’m definitely in the market for Glitz Glitter Gel. Yay, Gina! Beautiful colors and cards by the designers. Love the glitz glitter gel. Wonderful, love the look the gel creates. Thanks for sharing. The card is amazing Gina! I love that blue ink with the great glitz and glimmer gel. Thanks for sharing with us. These gels are great. Am looking forward to buying and trying some of them out. Gina, you did it again! What an amazing product. I just don’t know where to start with an order. The stamp sets are darling and the stencils are a must! Now to decide what colors of gel to start with ….. I just love the sparkle! These are two beautiful cards. I love the colors of the glitter gel. Forgive me if this is a duplicate but I don’t think my previous comment has shown up here. Anyway, I watched both Rina’s and Cathy’s videos (love their cards) and am so impressed with the new Glitz Glimmer Gel. Such an awesome release and a fun Blog Hop, Gina! My wish list keeps growing and growing and growing but my budget does not. Love the card!! Going to give it a try! Such a gorgeous way to add elegance and colour to any card project. Cannot wait to try the new glitter gel. Thank you for sharing…. place. Love the diagonal stripes. I love the new glitter gel. Loved Rina’s and Kathy’s videos. I fell in love with this glitter gel at Creativation! I want every color! Love both videos and all the new products! Lots of great ideas to try! 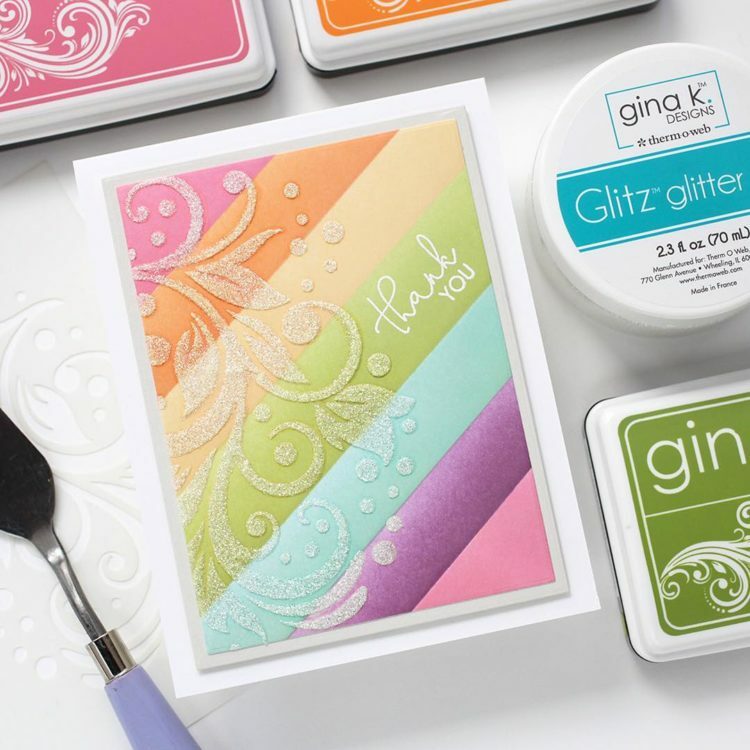 The new Glitz Glitter Gel is a great addition to Gina K.’s wonderful products. Love the cards by the designers! I love glitter! Bought 4 colors today but after seeing everyones cards I need to order the other 5. Just beautiful! Rina’s videos are always fun and her cards are awesome! I would like to comment on all the blog hops, but it is impossible to find the comments on some blogs. Such a lovely bunch of glittery beauty. The cards are gorgeous and I can’t wait to try the glitter gel! It is such a creative idea Gina! I love the touch of bling glitter adds. With the glitter gel, I don’t seem to dust it all over as much. Beautiful project Rina, and inspiring me for a future project. These are so pretty! Love that added sparkle! I’ve been so excited for this release. Such wonderfully beautiful, fun and creative new products. Amazing cards! I love this release! I like everything I’ve seen! I can’t wait to get some of the stencils and glitter gel and play! The cards on this page are amazing! I love blog hops! So much talent and creativity!! Love the new products. Truly adds a lot of glitz to the projects. Those glitter gels are amazing! I’m SO excited to try them out! WOW! So much to love in this release! Love those glitter gels! Great projects from everyone on the blog hop! Thanks for sharing! Wow, I am really loving all the products and how they coordinate. I just went through everyone’s blogs and the cards were all so beautiful and inspiring. I definitely will be putting these on my wish list. Both cards are amazing. Ill be giving them a go. Love Rina and her vodeos, so inspiring to us new crafters. Stunning cards. I’m working on getting all the colors. Have three so far. So easy to use. I am just loving the new glitter glitz gels. can’t wait to get some. Gina, I love the new glitter gels and that gold foil is so special! The glitter gels and foils are awesome! I’m so loving these glitter gels! Gorgeous card and awesome products!! Such fabulous cards. I love the “you are my favourite human” card – such a gorgeous background! I am loving those pretty card designs. As soon as I can afford the glitter gels they will be on my list of goodies to buy. And, I am loving the stamp and stencil sets as well. 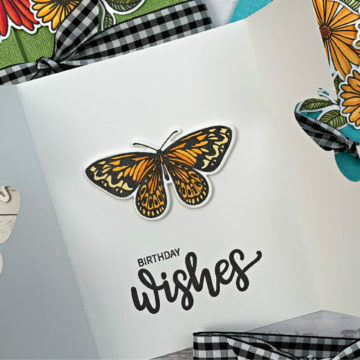 Beautiful cards, think the gel and stencils will definitely go on my “wish” list. Excited to see what the other designers have made. Oh Gina!!! This is amazing. I loved Rina’s card. I simply must get some glitz in my life! Thank you!! Looks like an awesome new product and can’t wait to order. Just love what Cathy Z did with the card she made. It is a very classy card and the new Glitzy Gel is just perfect. Can’t wait to get some. What a sparkly and shiny blog hop! Great new products! Love the new glitter gels! The hop was great for ideas! Off to play! So beautiful. I love the glitter gel. The end results is so posh! The dies used were great, I really need some of those nesting g rectangles. Thank you so much for sharing. These two videos will be saved for near future. Beautiful card! The glitter gel is awesome! Wow! I just love Cathy’s rainbow card. So soft and pretty. And the glittery design is just the perfect touch! That ‘rainbow’ card is fabulous! I will be trying my hand at that very shortly! Love, Love, Love it! Wonderful new products! Can’t wait for that stencil to be back in stock again!! I can think of so many different ways that i want to use it, along with the glitter gels! This will be fun and loving what I see so far. Cant wait to try the glitter gel. I just purchased the entire collection of Gina K inks. I couldn’t resist after taking a class with Gina & Rina. Next up GLITZ glitter gel. Both cards are absolutely colorful and eye-catching. I have bookmarked the videos so that I can rewatch at my convenience. Thank you for sharing your talents!!!! No fair. I want everything. It’s all so pretty. I just love love the glitter so beautiful can’t wait for more colors. Thanks Gina you are amazing.